Arabs are car crazed. This is one generalization that is safe to make. And Arab elites, are big car crazed. That’s another generalization safe to make. No wonder that public transport systems across the Arab world have not really evolved since the 1960s. Increasingly fueled by easy oil money, and increasingly alienated from the needs of the masses, the health of cities or the safety of the environment, ruling and economic elites have made Arab cities into car cities. From Beirut to Cairo, and from Amman to Riyadh, it’s cars, cars and more cars. Cars cool. Busses Bad. 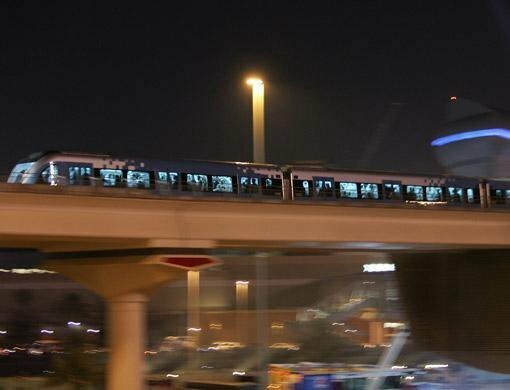 But as the Sheikhs of Dubai rode the US 7.8 Billion Metro tonight at 9 pm 9.9.09, suddenly, modern public transport has become cool. … I couldn’t but remember sadly that many many years ago, the working train in Lebanon connecting Beirut to Damascus, even to Istanbul, Baghdad (Iraq) and Hijaz, in Saudi Arabia. In 1891 a French company obtained a concession to build a railway from Beirut to Damascus and this was soon merged with a Belgian project (CF en Sync) for a line to Muzeinib serving the rich grain area of the Hauran. Formed in Paris, the Societe des Chemins de fer Ottomans Economiques de Beyrouth-Damas-Hauran at first planned a metre gauge adhesion line but the difficulties involved in ascending the Lebanon range behind Beirut resulted in the adoption of the Abt rack system for part of the route.